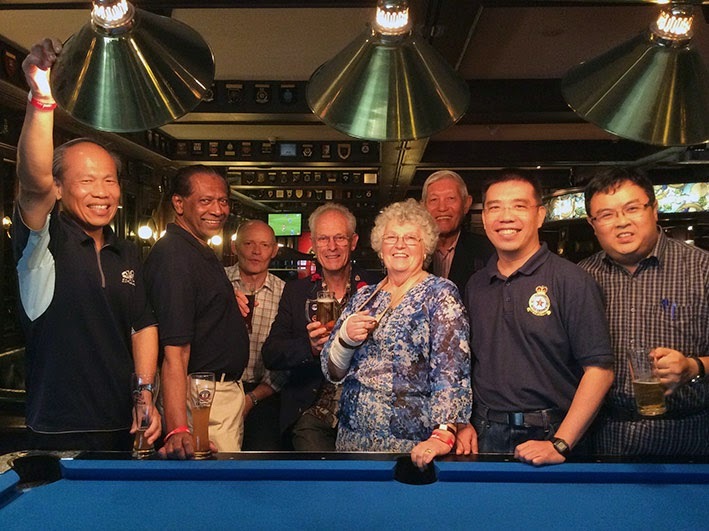 A small reunion takes place annually at the Tiger Tavern in the Tiger Brewery near Tuas. A few chaps from RAF 81 Photographic Reconnaissance Squadron who were stationed here in the late fifties get together for some ‘medication’, reminiscences and a moment of remembrance. Two years ago I, as a crusty old photogrammetrist, presented them with a double-sided silk map of Singapore and Malaya produced by Military Survey in 1957. It was particularly poignant as the survey photography flown by 81 Squadron would have contributed to the production of this map. The Squadron’s website contains a potted history and a more detailed e-book will soon be available. The Singapore chapter’s leader, Al Taylor is giving a talk at the National Library to share his life experiences on 23rd August from 3:30 - 5:00 pm. Click here for event details. While on the subject of survey and mapping, another honorary member of the group, Mok Ly Yng has been working on the Bukit Brown cemetery project. Bukit Brown off Lornie Road is the largest Chinese graveyard outside China with over 100,000 graves. The government is constructing a new highway through the cemetery, which has forced the exhumation and cataloguing of around 4000 graves. As vegetation obscures modern aerial photography and satellite imagery, the survey team used archive photography flown by the RAF to identify the location of graves. Over 45,000 frames of digitised photography are available on the National Archive website (click here, enter the keyword 'Singapore Land Authority' and leave the date blank to find all photos).